Víctor Muñoz Sanz contributed to Work, Body, Leisure with an essay on the research methodologies employed to document and examine the logistical infrastructure of the new, fully-automated APM container terminal in the port of Rotterdam’s Maasvlakte II. “After careful consideration, I kindly decline your request… Architecture and Design are not our business strategic priorities for communications.” Excerpt from e-mail correspondence with communications spokeperson of technology company Philips, who runs a “lights-out” factory In Drachten, Netherlands, in which robots assemble electric shaving machines. “We have discussed internally and unfortunately we are not able to make the time available to assist you in building up a case study.” Excerpt from e-mail correspondence with head of commercial of APM Terminals, the a fully-automated container terminal at the Port of Rotterdam. “Please don’t publish anything of below answers, it is just an explanation to your questions.” Excerpt from e-mail correspondence with public affairs & communications manager of Rotterdam World Gateway, the second fully-automated container terminal at the Port of Rotterdam. The notion of Automated Landscapes aims to address the emergence of distinct types of spatial configurations and conditions engendered and afforded by automation. Given that they are not designed for the inhabitation of human bodies, these architectures could potentially challenge conventional spatial requirements and normative rules for health, safety, and welfare, such as standards for light, ventilation, height, and floor areas, and bring new forms of territorial occupation, segregation, and contestation. They also remain beyond classic notions of authorship, and therefore the actors involved in their production and their motivations remain out of architectural debate. The possibility of visualizing the spatial conditions within these testbeds for new modes of automated labor clashes directly with policies of corporate secrecy: an obscurantism driven by a desire to protect competitive advantage, as well as reduce exposure of any misstep that could lead to public shame or stockholder distrust. Adopting technologies early, especially those that are still in development, is, in other words, a high risk endeavor. If economic debates speculating on postwork and posthumanism are burgeoning, large swaths of land are being reshaped by black boxes of automation, away from any kind of public scrutiny. Beyond mainstream formats of architectural dissemination, however, new spatial conditions, typologies, and relationships between bodies, work, and technology are being presented and considered via corporate channels, patents, and specialized media. Revealing the distinct spatial conditions afforded by automation technologies to a broader architectural audience, set in motion by opaque corporate environments, requires utilizing those alternative sources of architectural intelligence to model and represent those architectures, territories, and processes. The task demands urgency, as their implications might be far more profound for society than the mere internal rearrangement of operations and spaces within the walls of industrial and logistical companies. A look at Automated Landscapes could reframe the role of architects in designing the increasing presence of territories and spaces for non-humans, as well as speculate on the conditions needed for renewed human agency and political imaginations to unfold. In 1934, in Technics and Civilization, Lewis Mumford presented a history of technology that relativized the role of the machine in shaping civilization by putting emphasis on human choice. While the machine might have seemed, to the distracted eye, to be an inevitable, mythic force external to, but dominating of, human culture, according to Mumford, this view negated the fact that the machine (or “megamachine” as he also called it) was the result of “cumulative effects” moved by both deliberate and irrational human decisions. Amidst collective ignorance, it was the myth—not the reality—of automation that gave the rulers of the megamachine their power, he later claimed. As such, society was powerless in “altering the tempo of this process, or halting it when it ceases to serve human functions and purposes.” Mumford’s solution to this paradox was to study and understand the machine and its rise in a societal context as a way to master and put it in the service of human life. In resonance with Mumford’s work, in 1948, with Mechanization Takes Command, Siegfried Giedion presented a historiography that aimed to delineate the mechanization of production, agriculture, meatpacking, and domestic environments by observing and studying changes across disciplines. Giedion’s goal was to understand how diverse trends and shifts that had emerged concurrently across different fields in response to mechanization had affected our way of living, environments, attitudes, and thinking. Taylorism and Fordism, having irremediably penetrated our lives and altered the way we relate to our surroundings, were prime examples of his focus of study. Nonetheless, he noted, his task was hampered by a lack of sources accounting for the trends, events, and stories—what he called “anonymous history”—that had incrementally clustered through time and given shape to the present. The loss of manufacturer’s records, catalogs, brochures, advertisements, and other industrial ephemera was vilipended as an “amazing historical blindness.” This made of his investigation, he stated, not a comprehensive work of history, but rather an attempt to reveal a new field of investigation..
We seem to be at a similar crossroads, and in risk of collective blindness today. As writer Adam Greenfield warns, we should not “make the mistake of imagining [automation] as some impersonal, ahistorical transformation, beyond anyone’s control [i.e., a myth]; like any other process, its progress turns upon identifiable actors, acting from discernible motivations, intervening at material sites.” As automation technologies slowly accumulate and come together in those sites, seemingly banal objects and spaces start to shake pre-established modes of working and living. As such, research into Automated Landscapes aims to prevent a new stage of historical blindness by tracing automation’s anonymous history. The contemporary equivalent to those types of documents Giedion lacked should not just be archived, but used as a foundation to visualize the effects of automation in the design of the built environment and their impact on how we currently live and work. What might have once appeared as “organic changes” in architectural types and spaces over time must be revealed to have been intended or unintended outcomes of the pervasive presence of automation technologies and digital platforms. Disregarding this possibility is to effectively give up on harnessing the machine for the common good. The APM Terminals are highly securitized environments. A permit to visit the site for research was not granted, limiting field research to a public tour aboard the FutureLand Express Bus, which includes a visit to the private grounds of the terminal. The FutureLand ferry allows tourists to experience the visit to Maasvlakte II from the water. It offers a different perspective from which to observe and document the terminal and its autonomous machines. Maasvlakte II, the latest territorial expansion of the port of Rotterdam, boasts to be home of the two most technologically advanced container terminals in the world: the APM Terminals and Rotterdam World Gateway. Their landlord, the Port of Rotterdam Authority, moved by ambitious goals to become the greenest and most competitive port in the world, imposed very high demands in terms of sustainability and efficiency on new companies aspiring to lease its land. In particular, automation technologies were signaled as the panacea for achieving a radically efficient use of land, time, and energy in port operations. With automated processes requiring new kinds of machines, facilities, and workers, these logistical spaces are perfect case studies of automated workplaces and their broader socio-spatial implications. The absence of information and the opaqueness of corporations complicates reporting on industrial spaces. Building a case on the automated terminals in Maasvlakte II could not be done in a straightforward manner, as our research was effectively impeded by its companies. Moreover, the fact that the terminals are highly securitized environments limited another common research practice, that of field observation, to a bus ride within the context an public tour into the grounds of APM Terminals. It was eventually for the reason that Rotterdam World Gateway was not part of this tour that the study focused on APM. Alternative sources of data and architectural knowledge had to be used to model and represent its spaces and conditions. These sources liberate architectural research from traditional ways of measuring and re-constructing spaces, such as fieldwork, surveying, or research in architecture archives. Our study draws on fragments of information, data, and episodes acquired from secondary, publicly accessible resources that allow one to reconstruct the container terminal by assembling discrete elements using architectural methods from the outside in. Automated landscapes are the result of “platform architectures” being bunched together. Thus, a detailed account of equipment manufacturers and companies that have provisioned hardware and software platforms and services to the terminal is the privileged means to unfold the anatomic constituents of the site. Corporate press releases, specialized news items, articles, doctoral theses, promotional, training, and amateur video footage, and events identify actors, such as ABB, a Swiss company leader in industrial automation, for example, and the technologies they brought in. Web pages, technical documents, specialized corporate articles, photographs, diagrams, drawings, and patents can be used for analysis and visualization. The veracity of digital content produced by corporations must be carefully monitored by comparing wide array of sources in different media formats. A company like ABB is able to provide its clients not just with products and solutions for the instrumentation, automation, and optimization of industrial processes, but with a complete package that includes the integrated design of the workspaces from where these operations are supervised. ABB helps clients to “reduce architecture-related costs and shorten total project times.” Decisions on materials, spatial organization, and furniture for control rooms are made based on ergonomic studies—accommodating workers whose measure varies from a fifth-percentile female to a ninety-fifth-percentile male body—and high standards for climatic, acoustic, and visual comfort. “Operators are not static robots,” after all, as a commercial document by ABB reads. “They are human beings who thrive on variety, stimulation, activity and choice,” and as such, they are able to personalize their workspace and activate preset configurations—desktop height, light intensity and color, temperature—with the touch of a wearable device. Each constituent part of the space, from chairs and desks to lamps and wall panels, is detailed exquisitely in manuals and articles; all of the individual spatial elements and sample layouts are openly available online in Sketchup’s 3D Warehouse. In sum, ABB not only provides design advice and resources, but sells the whole package—from the remote control consoles to the adjustable chairs. In fact, as photographs show, ABB’s principles and products for control room design prevailed over any overall interior design concept of the APM Terminals office building. Assembling ABB’s models and product information, in combination with photographs of the implementation of these designs in actual settings, makes it possible to reenact the otherwise inaccessible space of a new type of control room in minute detail. On top of corporate sources, diverse additional material including, but not limited to, satellite imagery and online footage was consulted. The analysis of historical and contemporary satellite imagery obtained from Google Earth enabled a further understanding of the terminal’s process of construction, organization, and accessibility. Furthermore, historic maps were reviewed and reconstructed to comprehend in greater detail the development of the Rotterdam Port and its relationship with the city in general, and Maasvlakte II in particular. Photographs of the terminal taken from the vicinity and during public tours were complemented by online features such as Google Street View for a closer assimilation of the site’s surroundings and to provide a contextual understanding. Online footage released by APM Terminals and other suppliers as informational, training, and security videos (as well as others furtively taped by terminal users and truck drivers with dashcams) posted on YouTube were critically assessed. Specific features and processes concerning security and access depicted in the videos were translated into drawing. Drawings were reproduced with the use of various software, including AutoCAD, Rhinoceros 4, Sketchup, and Adobe Illustrator. 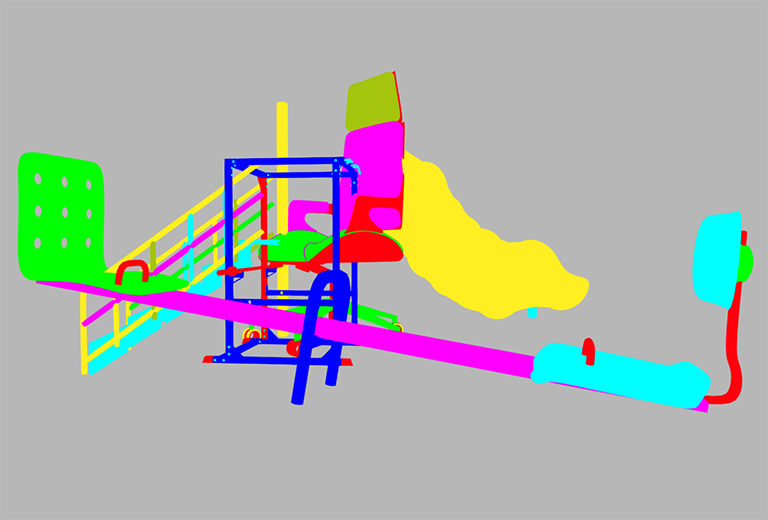 The production process iterated between three-dimensional models and two-dimensional representations of the site’s and its contents. The study of the APM Terminals reassembles architectural information from diverse sources across different media and scales into architectural representations, drawings, and models that portray its key elements and typologies and explain their rationale and implications. This method aims to communicate otherwise unfamiliar concepts and procedures to different audiences from diverse disciplines in an intelligible manner. The techniques of architectural representation also allow for new insights to be generated into the context of new modes of work and human-machine interaction. The representational techniques employed were purposefully conventional and “neutral,” to emphasize the drawings’ informative and explanatory character. Spaces may look familiar, but subtle details reveal fundamental transformations in spatial types and their meaning. The redesign of the control room typology for its use as hub to supervise automated processes is probably the most significant. The common image of a control room, born in the Cold War and still used in some industries or even operation centers of smart cities, consists of rows of operators sitting in front of desktop computers with large, wall-sized displays presenting a total overview of an incresingly complex environment to everyone in the room. Dismissed for their inneficient use of space and lack of flexibility, and, perhaps most importantly, for creating stressful and distracting situations to the operators, the old type is being succeeded.The new control room is decentralized and human-friendly. In it, the operator blends with the console in a “neocybernetic” fashion—the machine recognizes workers, adapts and reacts to their (standard) bodies and environmental preferences, and provides them with the information they need at the moment when and the location where, on the screen, it is needed. At the same time, the space is inviting for communication and collaboration between operators without cluttering and losing control. Besides purely operational reasons behind automation and remote control, the research also points to how those sectors transitioning from an industrial to post-industrial, automated, cleaner, and sustainable mode of operations, such as port logistics, might be employing architecture as a tool to legitimize themselves as good employers. Working on the port holds certain stigma, and modern port logistics demand few, high-skilled professionals which are hard to attract. Companies are therefore obliged to adopt external practices, spaces, technologies, and procedures—other institutional practices—that are well regarded in social or cultural contexts or have proved successful for other organizations. That is, they are externally legitimated in order to increase their attractiveness. Companies like ABB supply enterprises with technical and architectural solutions to create the ultimate desirable workspace, highly individualized yet collaborative and social. “All of these factors work in favor of attracting new and hopefully younger operators into the control room.” Nonetheless, automation technologies are adopted in spite of their potential conflict with efficiency. As a matter of fact, the path towards automation at the APM Terminals has been far from smooth; it is not yet operating at full capacity, and was victim to a severe cyberattack that paralyzed its machines for twelve days in June, 2017. Finally, the research also allows one to speculate about the future assemblages of humans and machines and question whether there is a de-coupling between the formal structure of these workspaces—their “blueprint for activities”—and the reality of the day-to-day job of human and machines. For while these working environments give the appearance that the user is in total control, their movements are only reactive to those of the machines, and their comfort preferences can “be automatically overridden by the process system in pre-determined situations.” Visualizing automated landscapes allows us to questioning the true agency of the posthuman worker within industrial processes of today. Lewis Mumford, Technics and Civilization (London: George Routledge & Sons, 1947 ). Mumford’s idea bears a very close resemblance to Benjamin Bratton’s more recent idea of the “accidental megastructure” of planetary-scale computation. See Benjamin H. Bratton, The Stack: on Software and Sovereignty (Cambridge, MA: MIT Press, 2015). Lewis Mumford, Arts and Technics (New York: Columbia University Press, 2000 ). Lewis Mumford, The Myth of the Machine. Vol. 2 (London: Secker & Warburg, 1971). Adam Greenfield, Radical Technologies: The Design of Everyday Life (London: Verso, 2017). I define “platform architectures” as the spatial conditions and typologies that result when converting labor-intensive industries and services to capital-intensive ones by adopting software and hardware platforms. For further reading: Víctor Muñoz Sanz, “Platform Architectures,” e-flux Architecture (January 23, 2018). “Control Room Design Control room solutions that put people and productivity first”, ABB (2017), p. 4. Ibid., 6. With ABB’s desk system “It’s even possible to have one temperature above the desk and another down on the floor for someone who suffers from cold feet.” ABB, “System 800xA Operator Effectiveness Control rooms of the future are here now” (2012), 4. See patent filing: ABB AB, "Automatic Configuration System For An Operator Console" (International, 2015). Per Lundmark, “Control room ergonomics with the operator in focus for an attractive collaborative environment.” ABB Value Paper (n.d). See: Antoine Picon. Smart Cities: A Spatialised Intelligence (Chichester: John Wiley & Sons, 2015). A patent filing by ABB refers to a drowsiness alert system in which a wearable device would monitor the operator’s vital signs. ABB AB, "Drowsiness Alert System For An Operator Console" (International, 2015). Per Lundmark, “Control room ergonomics with the operator in focus for an attractive collaborative environment.” ABB Value Paper (n.d), p. 6. For more on social legitimation of organizations and institutional myths, see: John W Meyer and Brian Rowan, “Institutionalized Organizations: Formal Structure as Myth and Ceremony,” The New Institutionalism in Organizational Analysis, edited by Walter W. Powell and Paul DiMaggio, p. 41–61 (Chicago: University of Chicago Press, 1991); .Paul DiMaggio, and Walter W. Powell, “The Iron Cage Revisited: Institutional Isomorphism and Collective Rationality in Organization Fields,” Ibid. p. 63–82; Peter A. Hall and Rosemary C. R. Taylor, “Political Science and the Three New Institutionalisms,” lecture presented at the Max-Planck-Institut für Gesellschaftsforschung, Koln, (May 9, 1996). Víctor Muñoz Sanz, "Captives in Futureland," Volume 51 (November 2017).